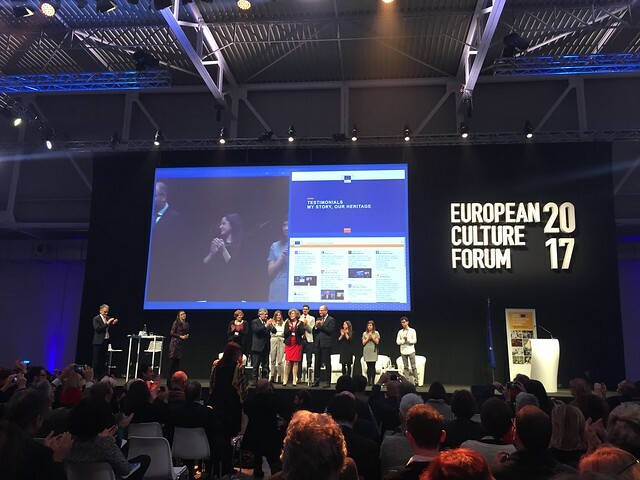 Today the celebrations for the 2018 European Year of Cultural Heritage are kicking off at the European Culture Forum in Milan. The European Year of Cultural Heritage will put the spotlight on Europe’s wealth of cultural heritage, showcasing its role in fostering a shared sense of identity and building the future of Europe. Attending the event today are President of the European Parliament, Antonio Tajani, the Estonian Minister of Culture, Indrek Saar, representing the Estonian Presidency of the Council of the EU, Italian Minister of Culture, Dario Franceschini, Chair of the Committee on Culture and Education of the European Parliament, Petra Kammerevert, and 800 EU representatives of the cultural sector and civil society. Among the speakers of the first plenary session entitled ‘Cultural heritage: the beating heart of Europe?’ is Sneška Quaedvlieg-Mihailović, Secretary General of Europa Nostra, also in representation of the European Heritage Alliance 3.3. The purpose of the European Year of Cultural Heritage is to raise awareness of the social and economic importance of cultural heritage. Thousands of initiatives and events across Europe will provide the possibility to involve citizens from all backgrounds. The aim is to reach out to the widest possible audience, in particular children and young people, local communities and people who are rarely in touch with culture, to promote a common sense of ownership. Projects and initiatives implemented in EU Member States, municipalities and regions will be complemented by transnational projects funded by the EU. The Commission will, for instance, organise with Member States the ‘Assises du Patrimoine’ as a flagship event of the European Year of Cultural Heritage in order to start work on a long-term EU Action Plan for Culture and Cultural Heritage. This will come as a follow up of the EU’s leaders’ discussions on education and culture on 17 November in Gothenburg. Europa Nostra is among the EU’s main partners for the European Year of Cultural Heritage. All of Europa Nostra’s activities in the coming months will contribute to the European Year. One of the highlights of the Year will be the European Cultural Heritage Summit taking place in Berlin on 18-24 June. Co-hosted by Europa Nostra, its member organisation the Prussian Cultural Heritage Foundation (SPK) and its partner the German Cultural Heritage Committee (DNK), which is the national coordinator of the Year in Germany, the Summit will engage and mobilise a wide range of stakeholders to advocate for an ambitious European Cultural Heritage Agenda. According to a new Eurobarometer survey released today, 8 out of 10 Europeans think cultural heritage is not only important to them personally, but also to their community, region, country and the European Union as a whole. A large majority take pride in cultural heritage, whether it is located in their own region or country, or in another European country. More than 7 in 10 Europeans also agree that cultural heritage can improve their quality of life. The survey also shows that 9 in 10 think cultural heritage should be taught in schools. Three quarters of Europeans think primarily Member States and the EU should allocate more resources to protecting Europe’s cultural heritage.